The Women Build committee is hosting the Christine Grant 5K on Saturday, May 4 at Terry Trueblood Park. This event is a wonderful way to celebrate the arrival of spring after a long, chilly winter! Everyone is invited to enter for a run or walk along the beautiful lake. 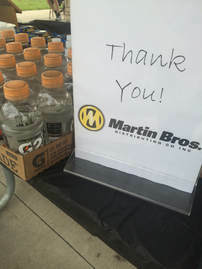 Every sponsor makes an important contribution whether you give time, food, bottled water, prizes, or make another contribution. Proceeds from the Christine Grant 5K support construction of the Women Build home. 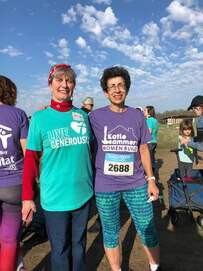 Monetary gifts or in kind gifts of snacks, refreshments, and prizes will help minimize our event costs so we can raise more money to build the Doris Preucil Women Build home. Demonstrate your social awareness and support of our community by sponsoring the Christine Grant 5K. As a benefit, your group or organization increases brand awareness by receiving recognition in marketing materials and during this event. Assist the Women Build committee by volunteering with event registration, set-up and tear-down, distributing snacks and refreshments, photography and more. Christine Grant became the first women's athletic director at the University of Iowa in 1973, a post she held until her retirement in 2000. After her retirement, Iowa merged its men's and women's athletic departments as one. Grant is best known for her fight for gender equity in athletics. She testified before Congress several times and served as a consultant for the Civil Rights Title IX Task Force. She was a founding member of the Association of Intercollegiate Athletics for Women and served in a variety of leadership roles with that organization. She also has held several positions with the National Association of Collegiate Women Athletics Administrators (NACWAA), including the presidency from 1987-89. Grant has held many leadership positions and received numerous awards and honors as an advocate of gender equity in sports. In 2013, Iowa Valley Habitat for Humanity chose to honor Christine Grant with the Women Build. As a Title IX defender and pioneer, Christine Grant was a clear choice. She remains an active Habitat volunteer by serving on the Women Build committee. Christine's support and guidance have been essential to the long-lasting success of the Women Build program at Iowa Valley. Naming the annual 5K after her is just a small token of appreciation for all she has done for our organization. Thanks for your commitment and dedication, Christine!